We investigate the family of intersection graphs of low density objects in low dimensional Euclidean space. This family is quite general, and includes planar graphs. This family of graphs has some interesting properties, and in particular, it is a subset of the family of graphs that have polynomial expansion. 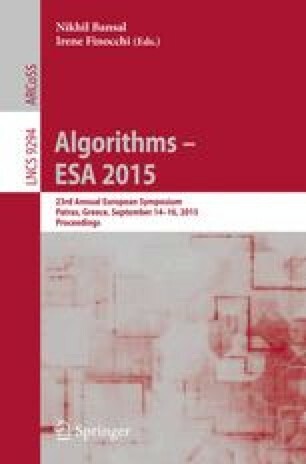 We present efficient (1 + ε)-approximation algorithms for polynomial expansion graphs, for Independent Set, Set Cover, and Dominating Set problems, among others, and these results seem to be new. Naturally, PTAS ’s for these problems are known for subclasses of this graph family. These results have immediate interesting applications in the geometric domain. For example, the new algorithms yield the only PTAS known for covering points by fat triangles (that are shallow). We also prove corresponding hardness of approximation for some of these optimization problems, characterizing their intractability with respect to density. For example, we show that there is no PTAS for covering points by fat triangles if they are not shallow, thus matching our PTAS for this problem with respect to depth. Work on this paper was partially supported by a NSF AF awards CCF-1421231, and CCF-1217462.